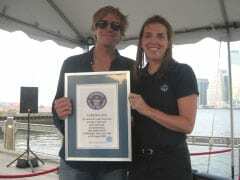 Jack Ingram is a awarded a Guiness World Record by Adjudicator Laura Plunkett. Ingram notched 215 interviews across most of the 50 states and parts of Canada, Ireland and Australia, easily shattering the previous record of 96 interviews. Ingram began interviews in New York City yesterday (8/25) at 8:00 AM at the base of the Brooklyn Bridge and continued through the night. He wrapped the session this morning with a performance of the album’s lead single “Barefoot and Crazy” on Fox & Friends. CMT.com exclusively streamed the event, and recorded a record number of viewers in what is also the longest continuous stream the site has ever attempted. “After the last 24 hours, I officially have nothing left to say,” concluded Ingram. Ingram will continue the momentum by jetting straight to his home state of Texas to play Dallas tonight and Austin on Thursday before rounding out the week opening three shows for Toby Keith in California. « Rosanne Cash To Keynote At Americana Conf.